As a garden designer, my interests are definitely garden related: plants, trees, beautiful landscapes and my favorite- fruits and vegetables because they come from the ground and I can eat them! My latest venture is to see, taste and handle as many edible plants that I don't know about and learn how to grow them. So , you can imagine how thrilled I was when I got an invitation to tour Melissa's World Variety Produce, the country's leading distributor of specialty fruits and vegetables! I tried to prepare myself by reading Melissa's Great Book of Produce by Cathy Thomas so I wouldn't ask dumb questions and reveal my ignorance of their exotic fruits. Are you familiar with or ever tasted a Cactus pear? How about a Horned Melon or Rambutan? Giant walk-in refrigerators housed the clean, packaged fruit. I wanted to see the fruits in their natural form, with dirt still clinging to them! So I asked a lot of questions regarding where and how they grow. I wanted to know if these different fruits grew as shrubs, vines or trees and how they would do and look in my gardens. The tour of Melissa's immaculate warehouse took a couple of hours and I didn't even see half of it. I can only imagine that the few steps I took in their distribution center represented thousands of miles that Melissa Marsh and her father, company Founder Joe Hernandez, trodded throughout the world searching for exotic delicacies to bring back to the American market. I felt privileged to be getting a preview of what American consumers were going to see on their produce shelves in the upcoming weeks. After all, I was in the company of the country's leading, globe-trotting, trend-setting produce pushers.  Melissa's passion for the edible plant is contagious and the reason for their great influence on what we all find on our produce stands. Do you enjoy gourmet baby vegetables? 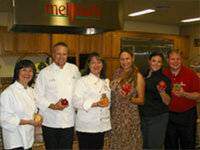 Thank Melissa's for introducing them to chefs nationwide a few years ago. 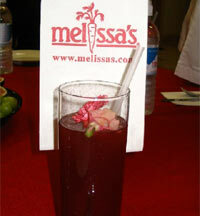 The hibiscus juice was tangy and delicious. I was treated to a delicious lunch prepared by Corporate Chef, Ida Hernandez in the company's luxurious kitchen. I thought I had stepped onto a Food Network stage! All the ingredients were picked fresh from the warehouse shelves. Crisp salad greens garnished with edible Chrysanthemum flowers, Hibiscus juice, exotic fruit platters, home-made passion fruit gelato for desert, so simple, yet so decadent. I shared my meal with Melissa and her husband Aaron Marsh, Robert Schuller, Public Relations Director for Melissa's, and Chef Ida. Shirley joins the Melissa's team for lunch. The conversation around the table turned to our mutual interests in edible gardens and how luxurious a simple meal from the garden can be. We toasted to our new friendship over Hibiscus juice and agreed that everyone should treat themselves and grow some fresh herbs, fruits or vegetables. As a gardener, I want to experience the growth of edible plants from the ground up to my table. If they fail to thrive in my garden, I can always count on Melissa's to supply my grocer and introduce me to what I've been missing. Take a look at the edible garden Michael Glassman and I created for the Garden Police Show on the Discovery Home Channel titled, "Tudor This!" *See more garden projects, before and after landscape photos and the latest in garden design with regular visits to Shirley Bovshow's EdenMaker's Blog!